Works with all Wayne Dalton Torquemaster garage door spring systems (single spring systems only)model numbers 8000, 8100, 8200, 9100, 9400, 9600, 9700, 9800 9900, 5120, 5140, FCII, WGII, TGII, Waynegard, Thermogard, Foamcore and other Wayne Dalton garage doors using the single spring torquemaster system. 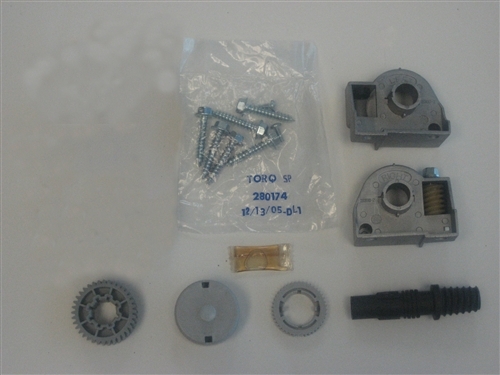 Right and left end bracketes, counter gears, winding gear, counter wheel, winding lubricant. The kit contained the parts I was expecting and the delivery was timely. the shipping charge was a little more than I would have expected. Overall I was very pleased with the service and thank you for the followup and will certainly as needed do business again.